John Martin is one of the illustrious Eversholt residents to have their own entry at Wikipedia. And at the Dictionary of National Biography! 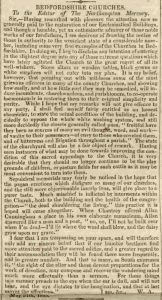 This text is from The Gentleman’s magazine and historical review, Volume 44, 1856. John Martin has a monument in the graveyard, and this was his obituary. Dec 30. At Froxfield, near Woburn, aged 64, John Martin, esq. F.S.A. John Martin, son of John Martin, of 112, Mount-street, Grosvenor-square, was born Sept. 16th, 1791. Having acquired the knowledge requisite for a bookseller under Mr. Hatchard, of Piccadilly, he commenced business in Holies-street, Cavendish-square, but soon after entered into partnership with Mr. Rodwell, in Bond-street, and published various interesting illustrated books, such as Gell and Candy’s Pompeiana, 1817-19; Capt. Balty’s Foreign Scenery, in several volumes, 1820-26; Major Cockburn’s Swiss Scenery, 1820; Sicilian Scenery, the drawings by Dewint, from sketches by Major Light, 1823, &c.
presented to him by the committee as a testimonial of their appreciation of his services. In 1834 was published “A Bibliographical Catalogue of Books Privately Printed, by John Martin,” with woodcut illustrations, 8vo., the result of years of labour and research, and one of the most accurate and valuable publications of the class to which it belongs; a second edition appeared in 1854. In the year 1830 Mr. Martin was appointed librarian to the Duke of Bedford, at Woburn Abbey, when he quitted London to reside at Froxfield, in the parish of Eversholt, near Woburn. In addition to the duties of this appointment, he interested himself most actively to promote the welfare and improve the social condition of all within his reach. 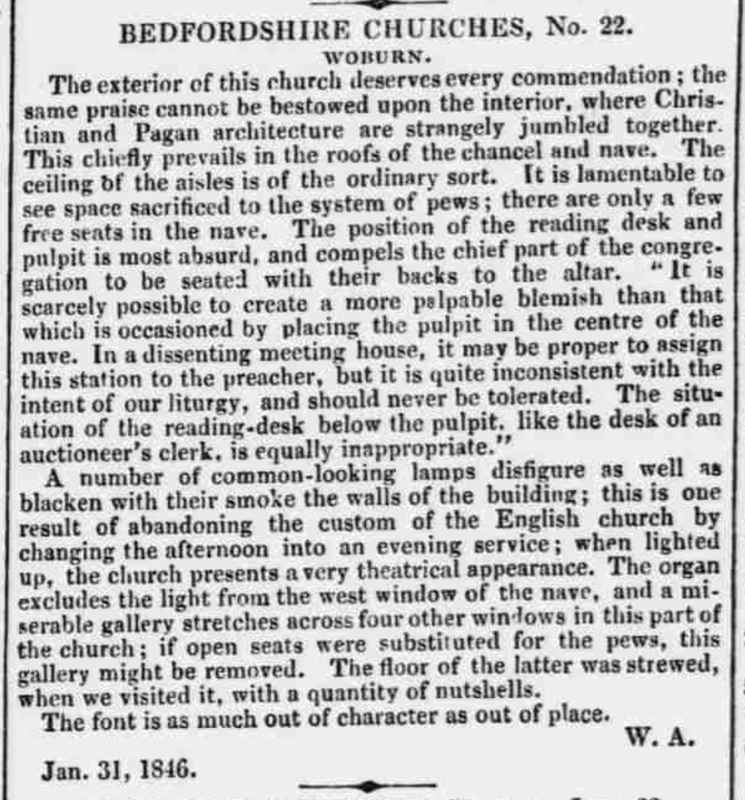 From his great love of archaeological pursuits, especially ecclesiastical architecture, Mr. Martin visited during his residence in Bedfordshire nearly every church in the county, and wrote a description of each edifice, and of the state in which he found it, forming a series which appeared in the Bedford Times and the Northampton Mercury; and to these local newspapers he also contributed occasional articles on various subjects. 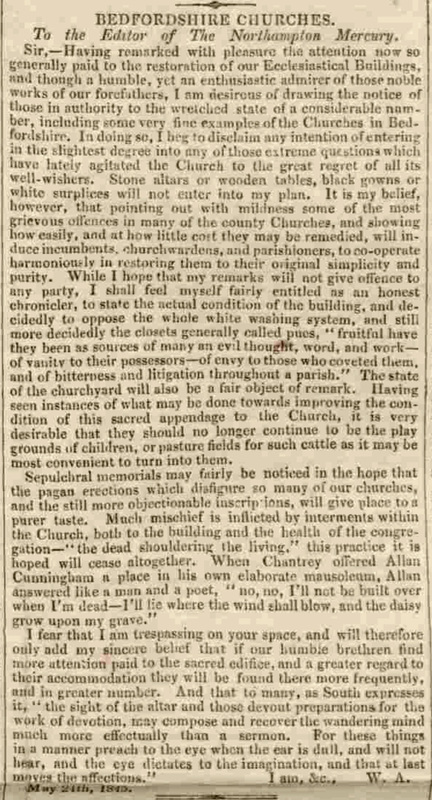 In 1852 he compiled an Inquiry into the Authority for Echard’s Statement in his History of England—that Lord Russell interfered to prevent the mitigation of the barbarous part of the punishment for high treason in the case of Viscount Stafford, upon the presentation of the petition of the Sheriffs Bethel and Cornish to the House of Commons, 23rd December, 1680; this was privately printed. He furnished some notes to the recent edition of Rachel Lady Russell’s Letters; and, in 1855, translated M. Guizot’s Essay on the Married Life of Rachel Lady Russell, published by T. Bosworth, 215, Regent Street. Mr. Martin became a widower in 1836, and of six children three only survive him, two sons and a daughter. His eldest son, John Edward Martin, is sub-librarian to the Honourable Society of the Inner Temple. 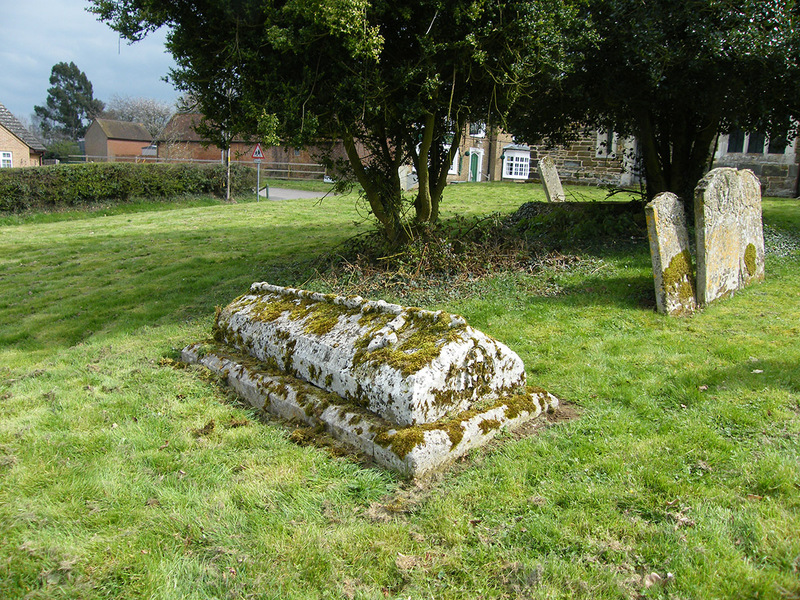 His body was interred in the churchyard of Eversholt. The “enquiry” mentioned above was one meant to clear the name of a Russell forebear. Viscount Stafford was implicated in the Popish Plot of 1678. Stafford was due to be hung, drawn and quartered. There was some arcane discussion as to whether he could just be beheaded instead, and he was eventually executed by beheading in 1680. Echard wrote a book saying that Russell wanted him hung, drawn and quartered; that is, wanted him tortured to death. John Martin, employed by a Russell descendant nearly 200 years later, wrote a pamphlet saying this was rubbish. The entire pamphlet is online free here, but the whole subject is so past interest that I (EJW) could only manage up to page 8. A little oddly, Echard’s book isn’t available online, but can be yours for a mere £35 at Amazon. John Martin made a survey of all the households of Eversholt in 1843. His name is also at the bottom (but oddly not at the top) of this appeal for funds for a school. 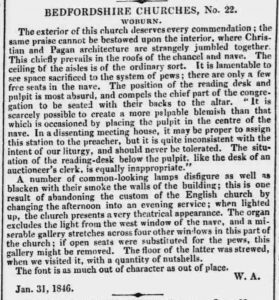 John Martin wrote a series of articles in the Northampton Mercury on the state of Bedfordshire churches. It seems he thought they deserved better maintenance. 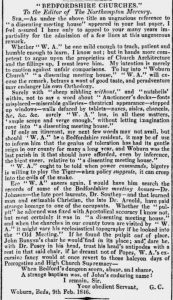 Often these articles were rather rude, and quite a few attracted grumpy letters to the paper in reply. Martin wrote under the pseudonym “W.A.”, and took some care to disguise his identity. Martin’s prose is very flowery to a modern reader, and it is sometimes hard to understand the point he is trying to make. 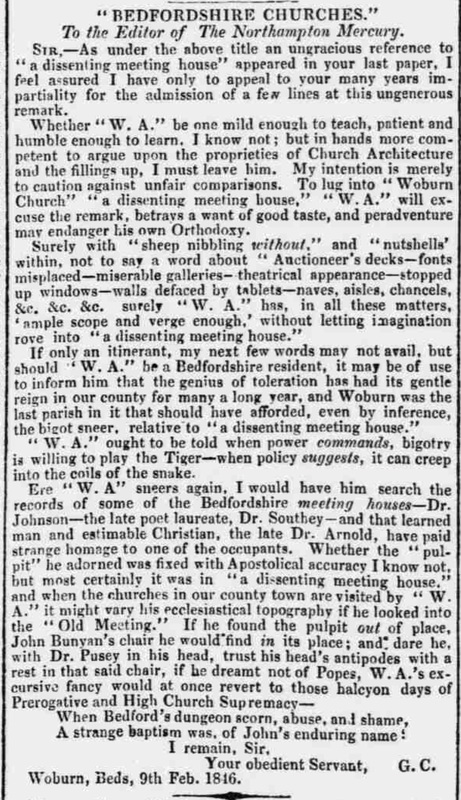 Here are some extracts from the Northampton Mercury, courtesy of the British Newspaper Archive. Very Grumpy letter about Woburn Article! On the 27th inst., at Eversholt, Bedfordshire, Arthur Hutcheson Bailey, Esq., to Emily, sole surviving daughter of John Martin, of Froxfield, Esq. Martin, Henry B, son of the late Mr. John, of Froxfield, Eversholt, Bedfordshire, at Montral, Canada, aged 48, May 21.